Piroctone Olamine, a wide spectrum antibacterial and antifungal agent, is able to soothe the inflamed scalp and reduces flaking by destroying the fungal infection. Piroctone Olamine, a wide spectrum antibacterial and antifungal agent, is able to soothe the inflamed scalp and reduces flaking by destroying the fungal infection. After six weeks of treatment, the dandruff will be decreased by around 80%. In the past various zinc based shampoos were used to control infections of the scalp but, in studies, Piroctone Olamine has proven to be more effective. It’s often said that, if you’re concerned about your hair loss, your shampoo should be the first thing you change. A recent clinical study of Piroctone Olamine has shown that shedding of hair dramatically lessens when dandruff is controlled and that Piroctone Olamine has a thickening effect on the hair shaft, giving the appearance of fuller hair. In other words by using Piroctone Olamine regularly you will not only control dandruff and inflammation of the scalp you will also have stronger and thicker head of hair. 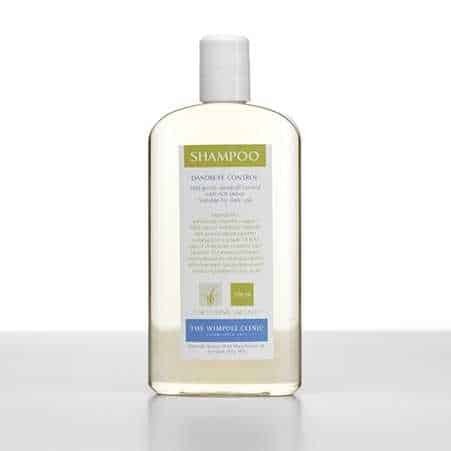 A specially formulated shampoo for the Wimpole Clinic. Leave on the scalp for 3-5 minutes. Rinse thoroughly. Ideal for daily or frequent use.